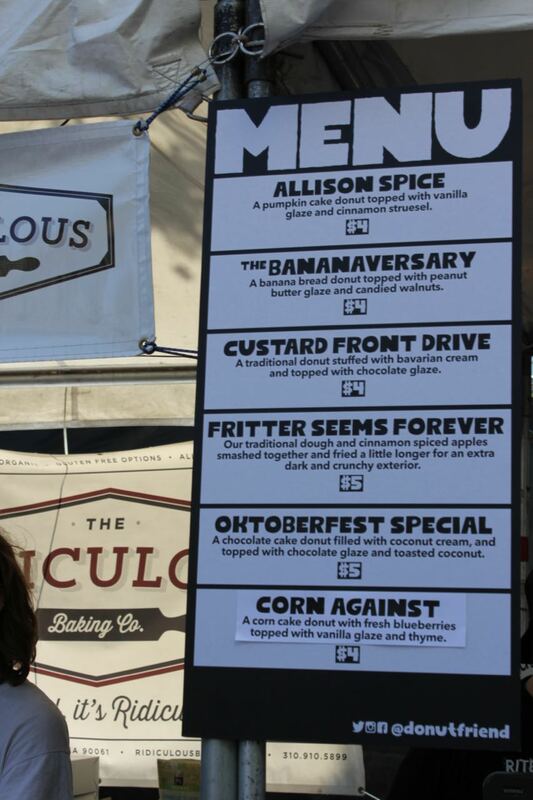 Vegan Oktoberfest is happening this weekend. If you didn’t get out there today, you’re still in luck. Vegan Oktoberfest will run again tomorrow – October 4th. If you went last year (for the first annual event), you’ll remember it was insane and poorly planned. The location last year was in a tiny parking lot at the beach somewhere between Venice and Santa Monica. They oversold the event, vendors ran out of items early, it was super packed, and there was a record heat wave that day (ok – they couldn’t do anything about that last one). This year was so much better. They changed locations and created the event for two days. This year’s event was at LA Center Studios – located just west of downtown and the 110 freeway. Not only was the space more than double of what they had last year, but there were also so many trees/buildings to provide shade around the area. My one complaint, though, would be that they could have set up more tents/tarps over the seating area for shade. Otherwise, I thought this event was a success. Were there fewer people in attendance? Maybe. All the lines seemed rather short. Maybe it was just better planning on the vendors this year? Maybe Sunday will be more packed? I don’t know, but was happy I didn’t have to wait in line for an hour like last year. I got the non-drinker ticket, because I didn’t want to spend a ton on the ticket price and because I was driving. I did have a taste of Ace Pineapple Cider from a friend and it was really good. If you like sweet and not really alcoholly taste – hit them up. I did get to try a lot of food, though, and I have leftovers to last pretty much a whole week’s worth of lunch. 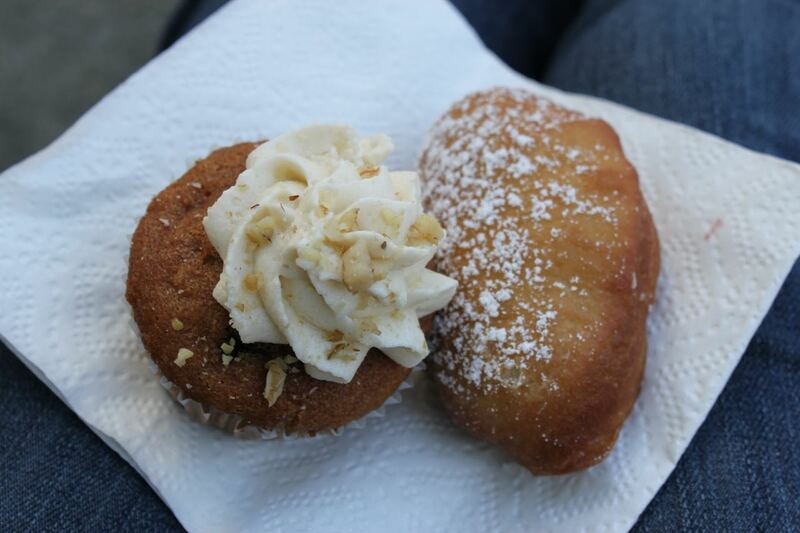 Stop 1: Ridiculous Baking Co does it again with their awesome Apple Strudel Cupcakes ($4) and Berliner Jelly Donuts ($3). They also had a German Chocolate Cake, which I did not have today, but have had in the past (yum!). 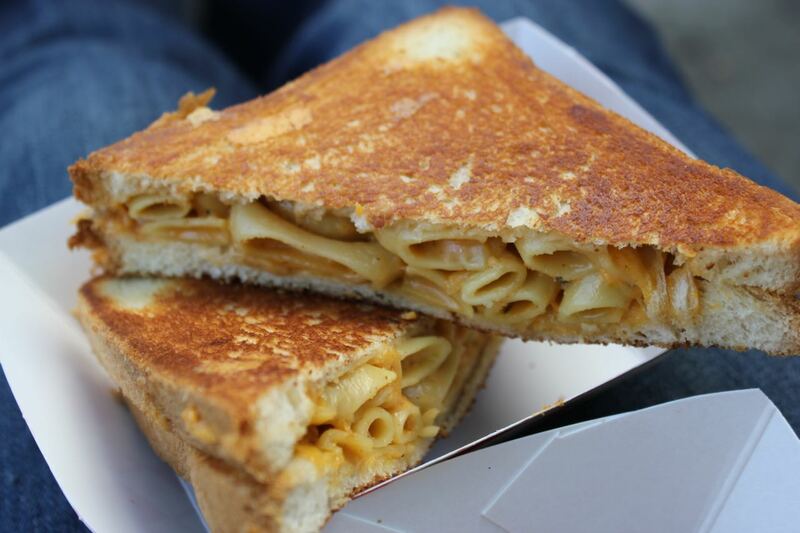 Stop 2: The Grilled Cheese Truck is always one of my stops at all these vegan events (including LA Vegan Beer Fest this past May). Their regular menu includes no vegan items – which is a shame, because they do them so well. 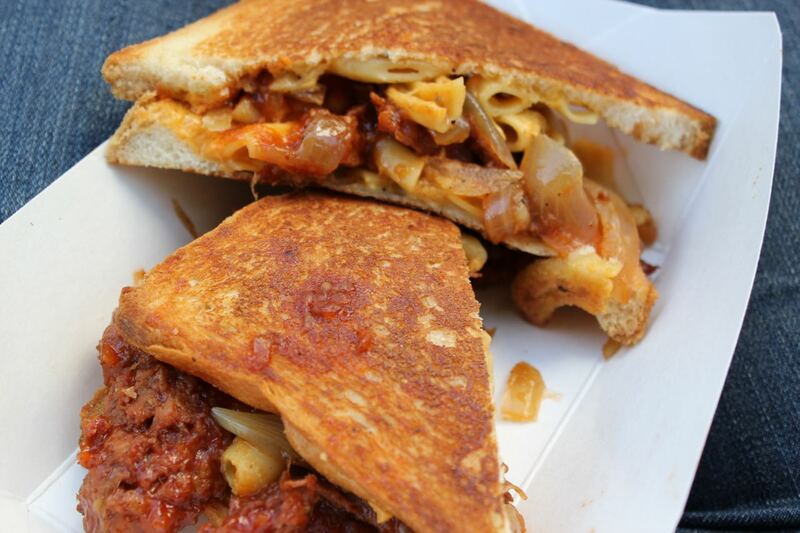 My two favorites are the Cheesy Mac Melt ($8) and the Cheesy Mac and Rib Melt ($10). 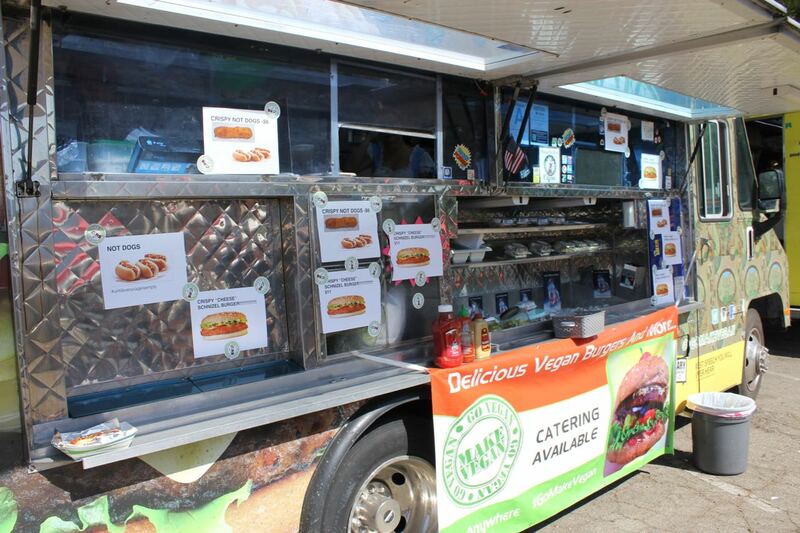 Stop 3: The Go Vegan Truck (or is it the Make Vegan Truck?) was new to me and I still can’t figure out their proper name. The Not Dog ($6) was one of my favorite savory items from the day. 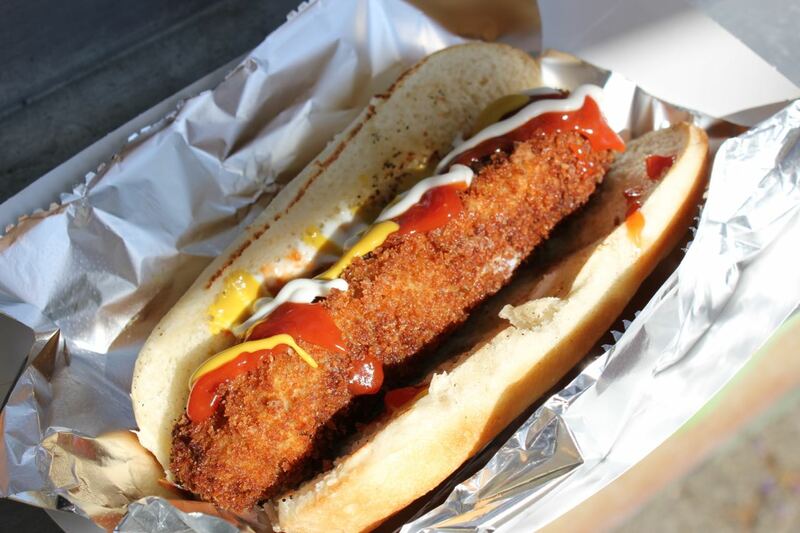 Take a vegan dog, batter it, fry it, and serve it up in a hot dog bun. Yum. Their Crispy Schnitzel Cheese Burger ($11) was also good. 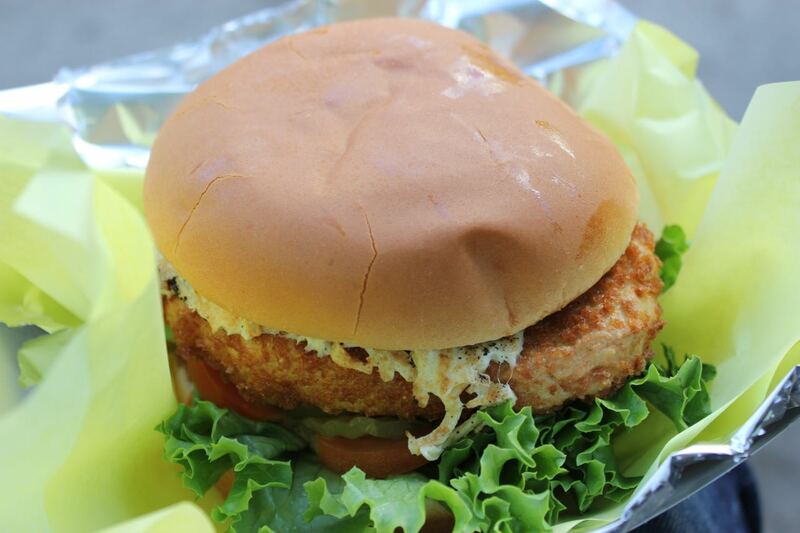 True to the name, the patty was crispy. It was a nice burger, but if I had to pick one item to order, it would be the Not Dog. I also tried one of their (unlabelled) desserts. 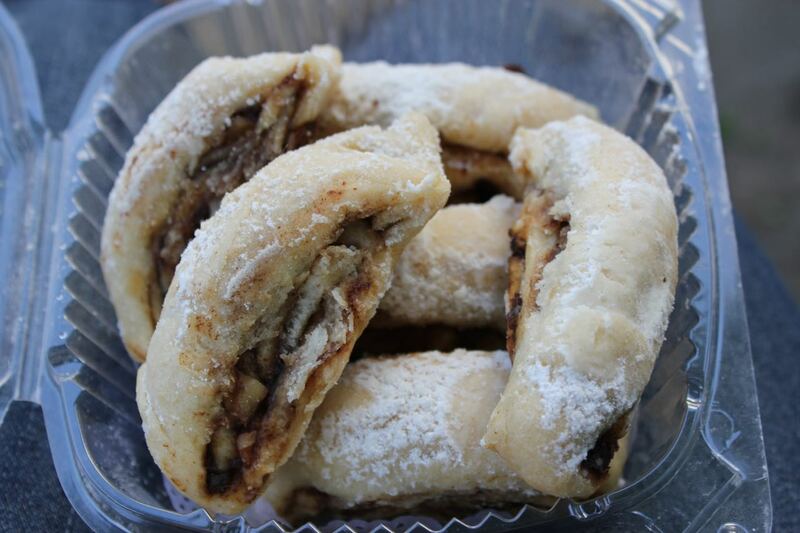 I think it was a Chocolate Rugelach ($5), and it was just ok. Slightly sweet, nice texture, but nothing to write home about. 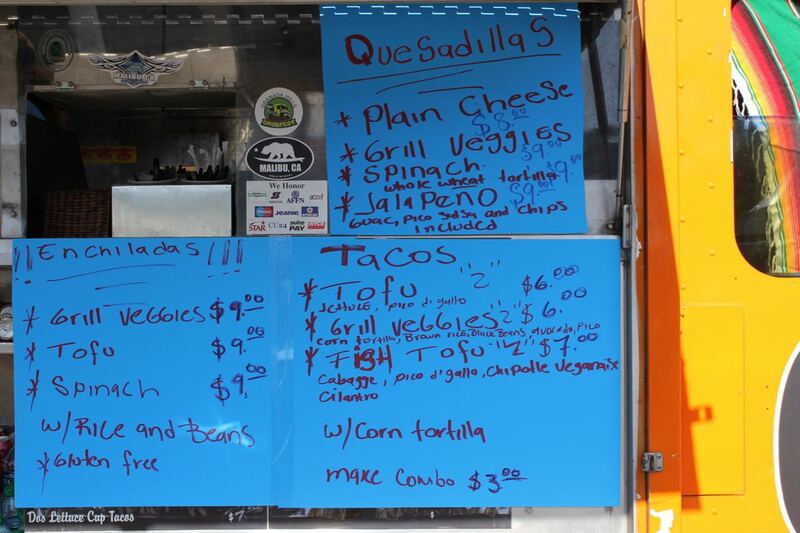 Stop 4: Sabores de Mexico looks like they serve all meat during their normal truck schedule, because they put up some (very hand-made) signs with a special vegan menu for the event. I really appreciate the effort, but unfortunately, I was not a fan. I got the Pepperdine Burrito which had rice, beans, pico de gallo, guacamole, Daiya, and tofu. I thought it was a little bland. Adding Spanish rice instead of plain ol’ white rice might have helped. Stop 5: Donut Friend has been at other vegan events, but I’ve always skipped them in hopes I would make it out to their shop in Highland Park. I have yet to go to their shop, so I decided to give them a go. Everything was amazing! 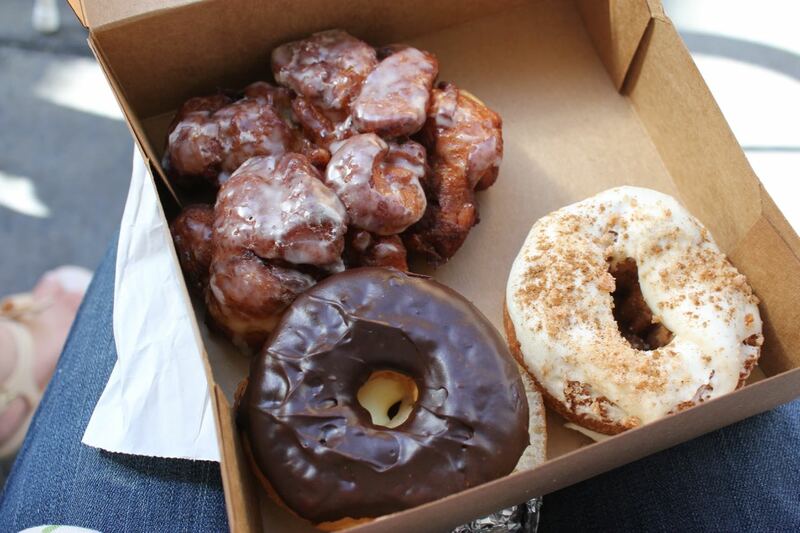 The Apple Fritter ($5) was the perfect texture, the Allison Spice ($4) was a pumpkin cake donut done right, and the Custard Front Drive ($4) had the most delicious custard filling. The chocolate glaze on the custard donut was a little more rich than I am used to being on raised donuts, but was not overpowering when combined with that creamy custard. Stop 7: Nary Dairy is allegedly ceasing operations and Oktoberfest was to be their last event. I hit them up to grab a container of Feta and two containers of Gouda for their 3 for $5 deal. It’s a great product and we are all sad to see them go. 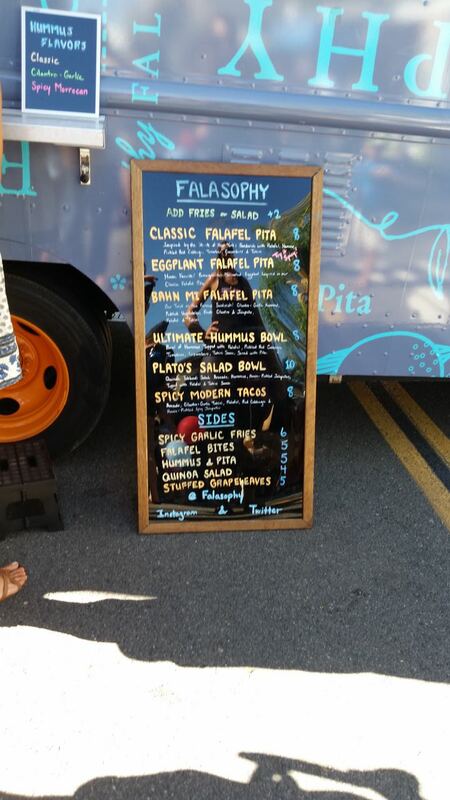 Bonus Stop: Falasophy was also at Vegan Oktoberfest, but I was too full to grab something from them. 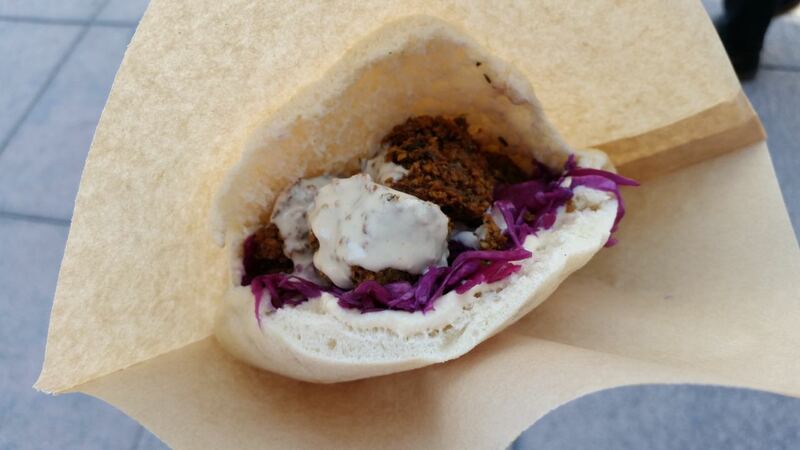 I did get their Classic Falafel Pita at another event and absolutely loved it. The pita was so thick and fluffy and I loved that they added hummus (as opposed to just a tahini sauce). Now I kind of wish that I had gotten one to go. Thanks to the organizers of this year’s event for making it a ton better than last year. See you next year! If you have any vegan friends in the LA area, chances are your newsfeeds were blowing up a few weekends ago with posts from the 6th Annual LA Vegan Beer Fest. 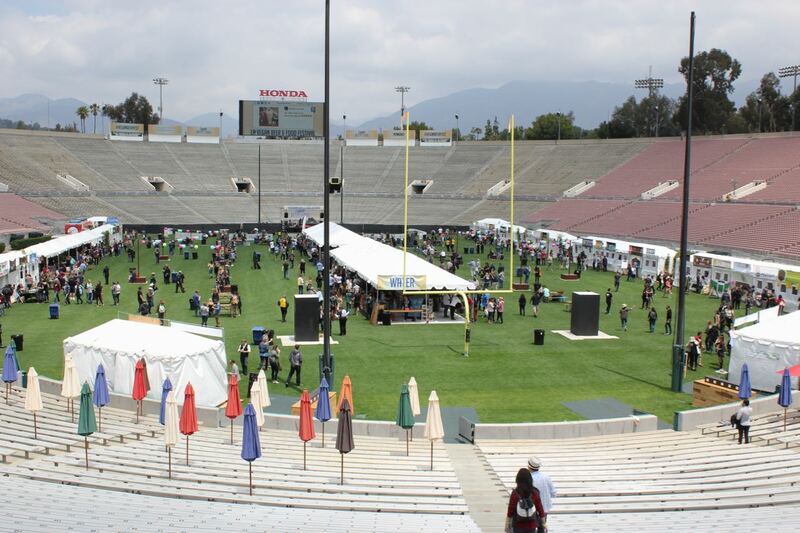 This year they moved the event to the Rose Bowl to accommodate the events huge popularity and vegans from all over the place flocked to Pasadena like a pilgrimage to the holy land. A friend of mine convinced me to get the VIP ticket (which allows you to enter the event one hour before everyone else) so I could avoid long lines. I’m super glad I spent the extra money – I got to the area before the crowds, found parking close to the entrance, and got everything I wanted to try before having to wait in long lines and before things started selling out. OK. I had to make some tough decisions and conserve the space in my stomach, so quite a bit of what you are about to read did get put into my handy tubberware and brought back home for when I would be hungry again… 4 days later. Have you heard?! Tutti Frutti has soy frozen yogurt! They have all the nutritional information on their website. It lists quite a few flavors, but I have only tried the Vanilla and Peanut Butter. This was at their Marina Del Rey location. I’ve also been to the one in Los Angeles on Wilshire, but they only had the peanut butter flavor. The Irvine location got rid of it due to low demand. I liked the flavor (more sweet and less tangy), but my vegan guy thought there was a chalky aftertaste. I can kind of see what he means, but it didn’t bother me that much. So go out and try it. If you like it, keep buying it – or it just might be gone forever. 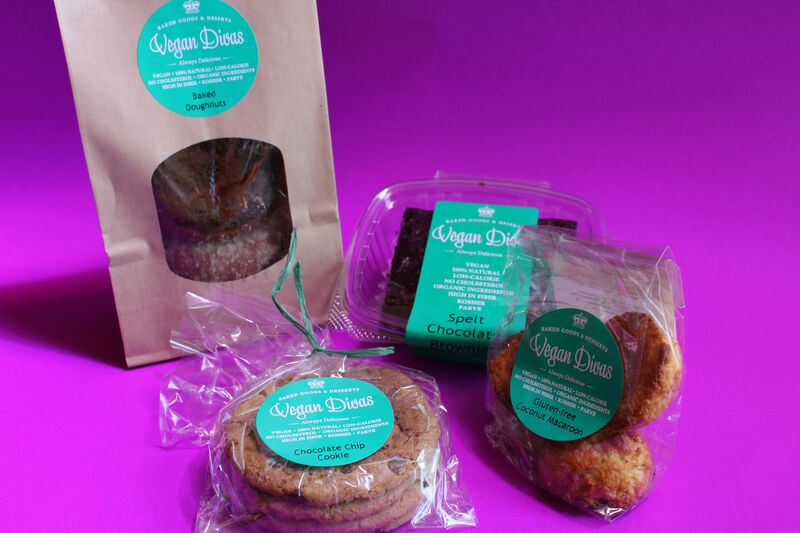 A while back I got a sample of products from Vegan Divas in New York City. I was curious if a freshly baked product can make its way to the west coast and still taste good. Did it? Read on. I liked the other goodies better than the doughnuts. First were some Chocolate Chip Cookies made with spelt flour. At first glance, these looked thin and crispy. I was pleasantly surprised to find that these were thin and soft. They had a very nice flavor and had just the right amount of chocolate chips. Spelt products have really taken a turn for the better. 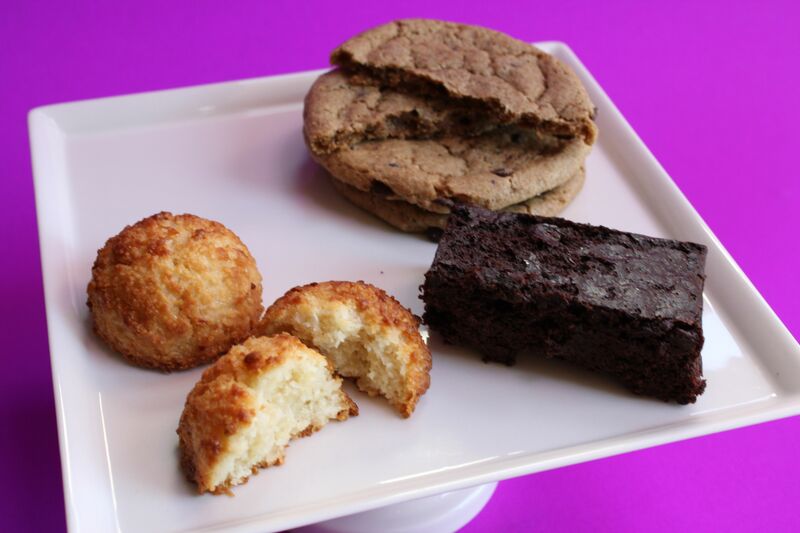 Another goody was the gluten free Macaroons. I normally don’t like macaroons, because every one I’ve had has been wet and full of long strands of coconut (ew). This one reminded me more of a cookie. 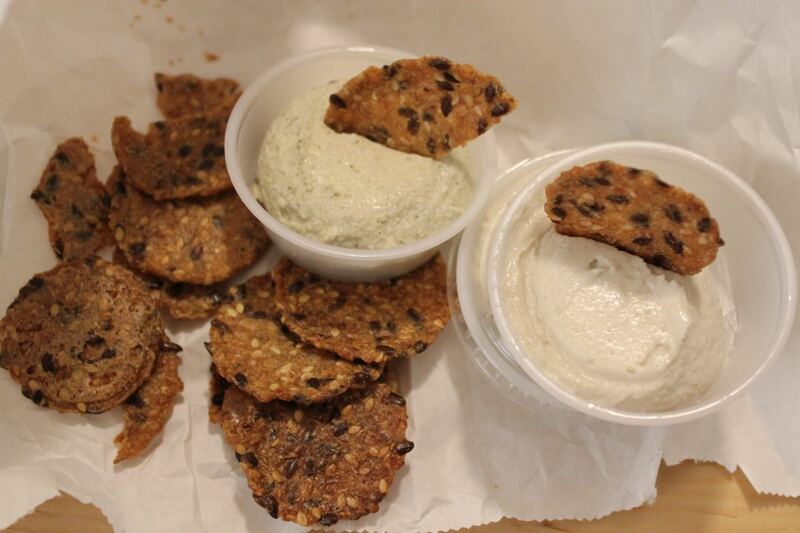 The chewier texture was a delightful surprise – score for the coconut! Lastly, I tried the Spelt Brownie. This is a stick-to-the-roof-of-your-mouth kind of brownie. Luckily, it wasn’t a bitter tasting brownie, but still wasn’t my favorite. I’ve had some better vegan brownies, but I also would not be disappointed had I ordered this for dessert at a restaurant. You can order these goodies and more at their website. Some items are only available for delivery in Manhattan, though. If you’ve been following my blog, you’ll probably have remembered I just went on a road trip to Oklahoma City for my cousin’s wedding. Well, my mom and I (and a sister) were at it again and went on a road trip to Lake Tahoe for another cousin’s wedding. Lake Tahoe is not too far from Southern California, but we wanted to make it a mini vacation, so we decided to have a few stops along the way. Mammoth Lakes is a hot spot for skiing (so I’ve been told), but also is a great place for summer outdoor fun. We weren’t there too long, but I did have a chance to notice plenty of bike and hike paths around the town. And since Mammoth is full of nature loving individuals, it didn’t surprise me that there were a few spots for vegan food. Our first stop was a place to get some snacks. Sierra Sundance Whole Foods is an awesome little health foods market. They had a great selection of vegan foods for snacking or preparing a meal in that cabin you’ve rented. Being in a small car with three women, we weren’t thinking “healthy snacks,” so we stocked up on some comforting sugary sweets. They even carried a local company’s vegan cookie! Speaking of that local cookie company – we passed Mimi’s Cookie Bar’s storefront on our way to our hotel and had to stop to see what other vegan selections they had. This cookie bar is really cute and they have both non-vegan and vegan goodies. We got some of their daily vegan cookies and their one and only vegan ice cream. The Mocha Almond Fudge Cookie (I believe was gluten free) was a bit dry, but had a good flavor. 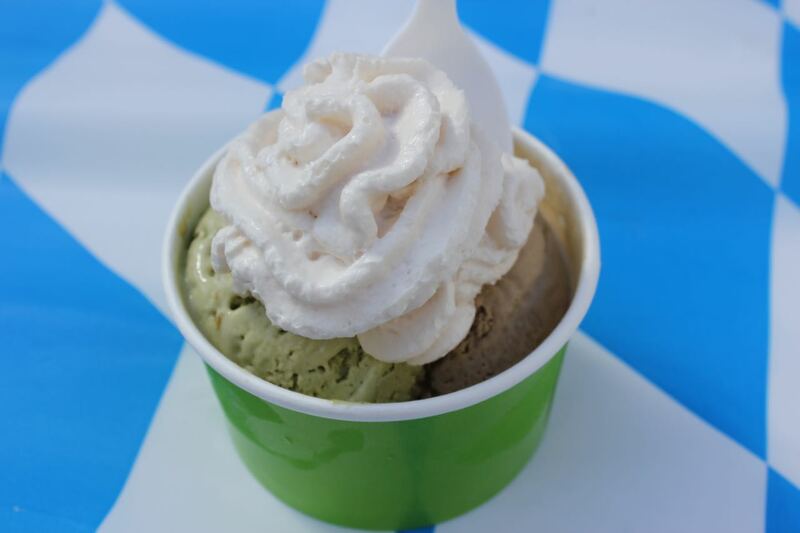 The Coconut-Lime Ice Cream was just ok – sort of gummy. The Apple-Cinnamon Cookies (from Sierra Sundance) were also getting a bit dry from sitting on the shelf, but would be fantastic fresh. And the Gluten Free Peanut Butter Chocolate Chip Cookies were some of the best cookies I’ve ever had (gluten free or not)!! We went back and got more of these cookies. And finally, on our way out of Mammoth the next day, we stopped to get a breakfast burrito at Stellar Brew & Deli. 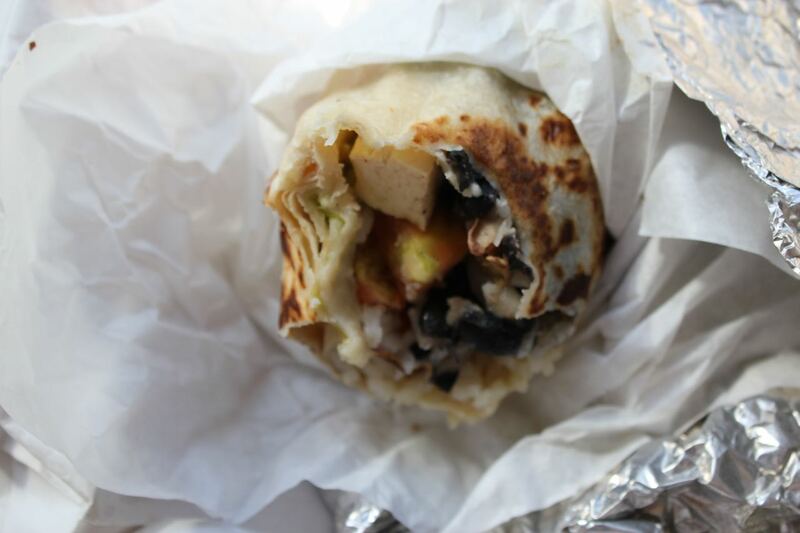 The Breakfast Burrito ($5.50) was full of carrots, potatoes, bell pepper, and vegan sausage. I thought it was a bit spicy, but good. I also had wished they used some tofu and no bell peppers (yuck!). It did give me that wholesome breakfast feeling so I could face the day of driving. Stay tuned for more from my vegan road trip, including stops in Ridgecrest, Lake Tahoe, and Sacramento! Kyotofu in New York City is a Japanese inspired cafe with a large bakery menu. I haven’t been here before, but I know it is not a vegan place. Their menu lists what is vegan and what is not, though. I can’t speak for their savory items, but I can speak about their vegan brownies. …Not good. Even though they were individually wrapped and marked with a “best buy” date a week later, they were very dry. The flavor was also a super deep chocolate – not my kind of brownie. It could have been better had they just been moist. I could get over the flavor by warming them up and serving them a la mode, but I couldn’t get over the texture. I hope they are better fresh from the store. Even though these brownies left a bad taste in my mouth, I still might try Kyotofu’s other items if I should ever be in NYC (I hear they have soft serve!). It’s Summertime! And that means vegans go out in search of frozen treats like non-dairy ice cream from Scoops. They’ve been around for awhile and most LA vegans are already in the know, but some of our dear vegan friends outside the LA Metropolitan area are out of the loop. I’m here to include those poor folks and let them know of a vegan ice cream option to try on their next trip to LA. Scoops has two locations. The original location is next to LA City College and the newer spot is in West LA. Scoops sells a bunch of dairy filled ice creams (gross!) and two or more vegan varieties (yum!). The flavors change daily, so you’ll never get bored. My latest trip to Scoops gave me Raspberry Chocolate and Oreo Ice Cream. I think it was either a very hot day or they changed the temperature setting on their freezer, because these scoops were a bit softer than I remember. I think it made them extra delicious. I also really loved the Raspberry Chocolate, because the raspberry really mellowed out the strong chocolate flavor. Most of the time when I go to Scoops, they have a chocolate based flavor, but I always find the chocolate to be too much for me. I have yet to go to the one in West LA, but they are nice enough to update a facebook page so you know what flavors are available. The original location is very popular and sometimes sells out of the vegan flavors before closing on Saturday nights. There used to be an awesome vegan restaurant across the street (RIP Pure Luck) and I asked if their closing had any influence on the amount of vegan ice cream Scoops was selling these days. I was told that there was a decline at first, but now everything is about the same. Good for them! I’d hate to see the demand get so low that they would discontinue their vegan flavors. I would like to share that this week So Cal Vegan Gal hit 1,000 views! That means my vegan guy is super supportive of my blog! No, no – he’s pretty normal… sometimes (wink, wink). But really, I would like to thank everyone who visits my blog. It really means a lot to me knowing that I am not just sending this information out into the cold, black space. And I even get some views from pretty random places around the world. I don’t know what brings them to a blog about being vegan in Southern California, but if you happen to be reading this from overseas, “Welcome! Thanks for reading my blog! !” I say very slowly and loudly, because we all know that if we speak to non-English speakers very slowly and loudly, they will understand. And now back to the post. Sage Vegan Bistro is one of those places that has a large and varied menu that changes often. It’s a good thing if you don’t like what they offer one month, because, most likely, the next month they will probably offer something else. However, if you absolutely love something, you might be disappointed the next time you dine here. Both have happened to me. Right now, though, lots look good to me on their menu. I better start making more trips to the Echo Park area before these items disappear. On a day with tasty-looking menu items, my vegan guy and I went in for brunch. I started with the Polenta Cake ($8.95): fried polenta topped with tomato confit and sautéed spinach with green pesto sauce. What a delightful dish. The tastes just blended so nicely and I always feel like I’ve earned some bonus points by starting off my day with some greens. I also ordered the BLTA ($11.95) served on a croissant. For me, the bacon was too smokey. After eating some of it, I really ended up just wanting that amazing croissant. Next time I’m asking for the croissant with some jam. My vegan guy got the Spinach Avocado and Walnut Sausage Florentine ($11.95): served over fresh baked baguette, topped with hollandaise sauce, and comes with roasted potatoes. From what I remember, I think he liked it all right. Also from what I remember, I think I liked his dish more than my BLTA. BONUS: Inside Sage Vegan Bistro is a Kind Kreme. Easily get your vegan dessert after your meal! Santa Fe, NM is a pretty artsy-fartsy town, so one would think they’d be the open minded kind of people to have some good vegan food. I found a few good spots, but not a whole lot. One of these spots was a small chocolate shop that offers some vegan varieties. Kakawa Chocolate House may not label anything as vegan, but most of the dark chocolate truffles are vegan. We asked the chocolatier and she was very helpful to point out what we should get. From their selection we got four different vegan chocolates. The Pomegranate Truffle (chocolate, agave, pomegranate, vanilla) was my least favorite – the most bitter. The Rose Truffle (chocolate, agave, rose water) and the Dark Chocolate Truffle (chocolate, agave, oatmilk, mexican vanilla) were both very creamy and less bitter than the pomegranate. My favorite was the Dark Chocolate Pistachio Clusters – the creaminess and saltiness of the nuts cuts the strong bitterness of the chocolate. Each truffle is around $3-3.50 and is worth the stop to this very cute store. Because my mom and I were on a road trip, we didn’t have many meal opportunities to eat in Santa Fe. We wanted to spend dinner at a vegan friendly restaurant (Body Cafe), but got there at 8:28pm. Apparently the kitchen closes at 8:30pm and the whole place closes at 9pm. WTF? We made the deadline and they turned us away. Not cool! So we stopped at a Whole Foods on the way back to the hotel and got a bunch of vegan food. The Couscous Salad and the Red and Black Quinoa Taboule from the deli case weren’t that great, but the Sonoma Wrap (Gardein chicken salad wrapped with grapes in a tortilla) was delicious! They even had some vegan donuts! The donuts were displayed from MIGHT-O. I thought it must be a typo, but what were Mighty-O donuts doing in Santa Fe? When we got back to the hotel and I tasted them and I knew they were from Mighty-O. I didn’t like them when I had them in Seattle, and I still didn’t like them. They have this sort of chemical leavening flavor. 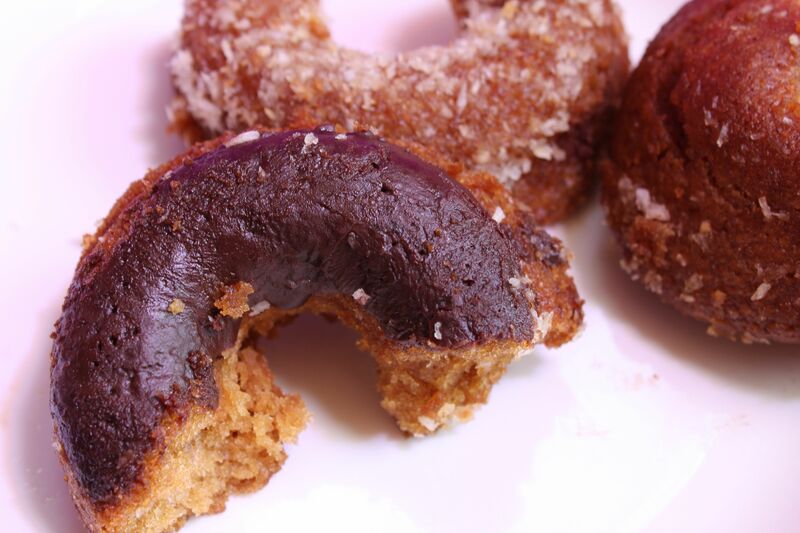 Not my cup of tea, but very exciting that vegan donuts exists in Santa Fe. When we finally made it to Body Cafe, my mom and I shared two vegan-friendly dishes. Body Cafe didn’t have a whole lot of vegan dishes to choose from. 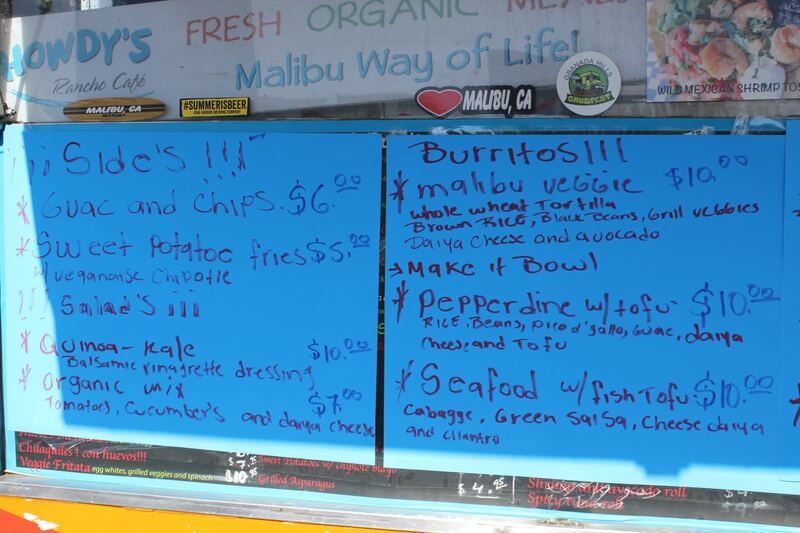 A few dishes are raw and they have many juices/smoothies. One thing that really irked me (besides being turned away before they closed the night before) was their statement on their menu. Describing vegan, Body Cafe states it “does not contain any animal products including eggs, dairy. We often use honey in our vegan recipes.” So your vegan stuff isn’t actually vegan if it contains honey (yes, I know some vegans eat honey). Knowing I now have to ask if their vegan food is actually vegan, I discovered that the Caesar Salad ($11.95) [romaine hearts, jicama, sunflower croutons, capers, house caesar dressing] is totally vegan. Maybe it was my annoyance at Body Cafe, but I just wasn’t too thrilled with the food. My mom enjoyed it, though. And the Green Chile Burrito ($9.95) [tofu, pine nut cheese, green chile, potato, garlic, tomatoes, cilantro, salsa fresca, onion, spelt tortilla] just wasn’t that good, either.